New Liturgical Movement: Are Traditional Catholics “Weird”? How often have we heard it said, in one way or another, that traditional Catholics are “weird” because of the way we dress, the things we are earnest about, our devotion to liturgy, our adherence to the old ways, our tendency to withdraw from popular entertainments, and such things? How often have we heard well-meaning advice that, when it comes to our tastes, opinions, and practices, we must be careful not to be “too different” from our surroundings? This message is not only false but dangerously false. All reform movements in Church history have turned their backs on aspects of the society or culture of their time — precisely those aspects that represented compromises with worldliness or secularism. As Pope John Paul II said, apropos today's secular world: “It is urgent that Christians should rediscover the newness of the faith and its power to judge a prevalent and all-intrusive culture.” Those who are valiantly confronting, resisting, and striving to overturn the anti-catholic culture of modernity, which is nothing if not prevalent and all-intrusive, are therefore doing just what they should be doing, as soldiers and witnesses for Christ by the seal of Confirmation. Homeschooling is considered “weird” by conventional Americans, yet millions of Christians in the United States, including many traditionally-minded Catholics, have embraced it as being more in keeping with the rights and duties of parents, particularly when the institutional alternatives are so disgracefully bad. Great Books liberal arts education is considered totally out of date, old-fashioned, irrelevant, and even fringe, but Catholics who have taken up this model at various levels of education are proving it to be perennially efficacious and highly fruitful. Believing that such things divorce, contraception, abortion, or homosexual activity are wrong is seen as utterly weird by an increasing majority of our fellow citizens, but faithful Catholics will reject these evils as the bitter poison they are, no matter what happens. Being Catholic in any serious way — believing in the Incarnation of the Son of God, in the seven sacraments, in the Real Presence of the Body and Blood of Christ in the Holy Eucharist — qualifies us in 2016 as the weirdest of the weird. Today there are Christians who drop out of this strange consensus of modern existence, who attempt new forms of life. To be sure, they don’t receive any public notice, but they are doing something that really points to the future. In our age faith has largely disappeared as a publicly formative force. How is it to become creative? Has it not been driven back everywhere into being a mere subculture? . . . But even in the Western world, the word "subculture" should not frighten us. In the crisis of culture we are experiencing, it is only from islands of spiritual concentration that a new cultural purification and unification can break out at all. Wherever faith reawakens in lively communities we also see how Christian culture develops anew, how the communal experience provides inspiration and opens new paths that we could not see before. Close association with monastic communities will certainly be one way to have an experience of the Christian reality. In other words, if society in its totality is no longer a Christian environment, just as it was not in the first four or five centuries, the Church herself must form cells in which mutual support and a common journey, and thus the great vital milieu of the Church in miniature, can be experienced and put into practice. Maybe we are facing a new and different kind of epoch in the Church’s history, where Christianity will again be characterized more by the mustard seed, where it will exist in small, seemingly insignificant groups that nonetheless live an intensive struggle against evil and bring the good into the world—that let God in. The most missionary centuries in Church history were also, by some strange coincidence, steeped in ecclesiastical traditions (think merely of the great wave of missionaries to the New World in the 16th and 17th centuries, all of whom brought the traditional Latin Mass and Divine Office wherever they went, and planted them firmly in the souls of their converts). In contrast, the past 50 years have been characterized by a drastic decline in religious life, a devastation of the priesthood, and an unprecedented collapse of missionary work. We are beginning to recover from these things, but only because we are recovering from the pseudo-theological drinking binge of the 1960s and 1970s — and with what a hangover! In the final analysis, to take shots at the Church’s Tradition or at those who love and treasure it is a form of Protestantism, or worse, a form of Modernism as St. Pius X defines it. Catholicism is defined by its Tradition; take this away and you take away the Faith itself. Moreover, ecclesiastical traditions — even if not part of the apostolic depositum fidei — deserve to be gratefully received, humbly embraced, and reverently preserved. May the Lord grant us the grace to be countercultural fools for Christ. Encyclical Letter Veritatis Splendor, 88. Joseph Cardinal Ratzinger, Salt of the Earth, trans. Adrian Walker (San Francisco: Ignatius Press, 1997), 128. Joseph Ratzinger, "The Image of the World and of Human Beings in the Liturgy and Its Expression in Church Music," in A New Song for the Lord, trans. Martha M. Matesich (New York: Crossroad, 1997), 126. Salt of the Earth, 264-65. Salt of the Earth, 16. John Paul II, Ad Limina Address to the Bishops of Washington, Oregon, Montana, Idaho and Alaska (9 October 1998). On these and kindred points, see the excellent books by Fr. Chad Ripperger, The Binding Force of Tradition and Topics on Tradition. 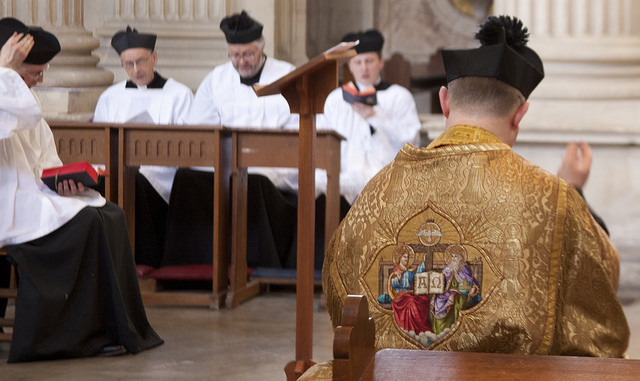 Photo credits: Joseph Shaw/The Latin Mass Society of England & Wales. 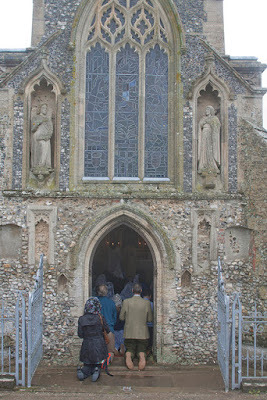 The photo of people kneeling in the rain was of a High Mass in one of the very few medieval places of worship in Catholic hands, the Slipper Chapel at Walsingham, which has just been declared a Minor Basilica. 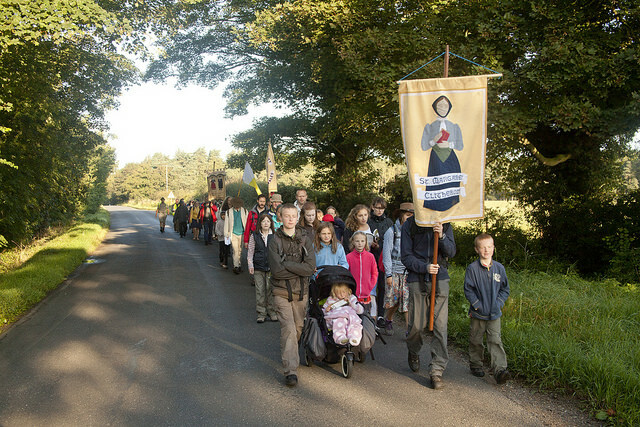 This Mass was the culmination of a 58-mile walking pilgrimage organised by the Latin Mass Society.